Below is a brief biography on the Australian commander in charge of Operation Falconer, the name given by the Australian Defense Force its to contribution to coalition forces in Iraq. 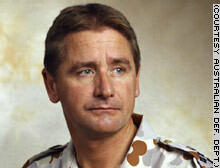 Command: In November 2002 he deployed as Australian National Commander for Middle East Area of Operations. McNarn monitors the assignment of Australian Defense Force forces and can veto any proposed tasks that fall outside bounds set by the Australian government. Years of service: McNarn entered the Royal Military College at Duntroon, Australia, in 1975, graduated in 1978 and was assigned to the Royal Australian Signal Corps. Previous commands: He has served as commanding officer of 1st Signal Regiment (1st Division) and commanding officer of the Deployable Joint Force Headquarters in 1994/95.�In 1999, he was appointed commandant of the Royal Military College in December 1999. In January 2002, McNarn was appointed director general of Joint Operations and Plans at Strategic Command, Australian Defense Force headquarters.